At higher downforce circuits you're sure to find a winglet placed in the middle of the rear wing you've often heard referred to as the Monkey Seat. Contrary to popular belief the Monkey Seat (Y100 Winglet) doesn't produce a huge amount of downforce by itself, its role is to assist in the performance of the diffuser and rear wing. That's not to say that their design is not crucial, as any airflow coming off it can aid or disturb elements like the diffuser and rear wing. It's design needs to complement its surroundings and so you'll see variation between each team, just as we do other components. (as one Monkey Seat might not work with someone elses Rear Wing design). It's design depends on what the team are trying to achieve, whether it be more low speed, peak downforce or a larger window of opportunity. 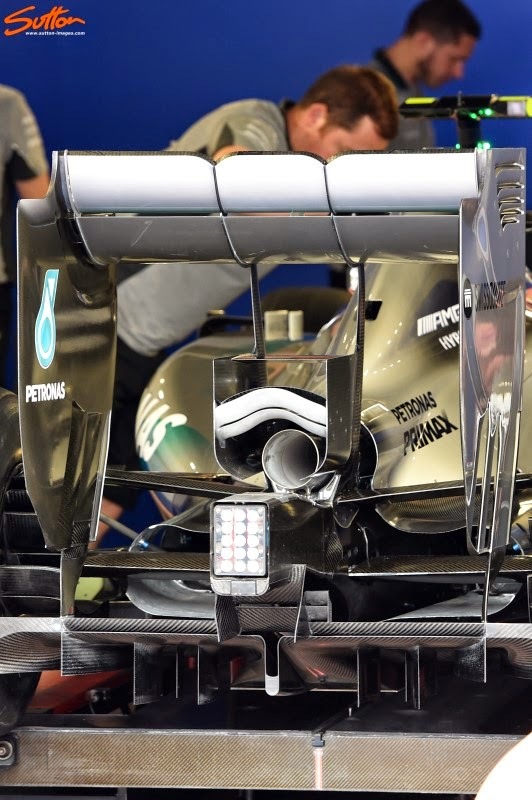 The array of winglets that proliferate this area can only extend 100mm either side of the cars centreline (Y100) and with the exception of the regulations pertaining to the exhaust the area is fairly free in terms of design constraints. To create more downforce at a lower speed the team retain the rear wings usual angle of attack (AoA), but due to the upwash created by the Monkey Seat the airflow makes the wing work harder. 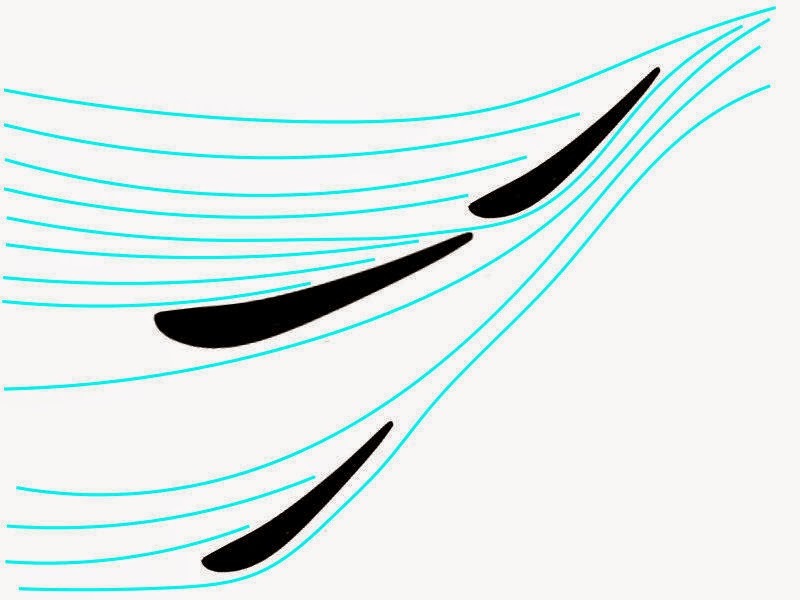 As we can see in the image above the at low speeds there isn't sufficient airflow for the top flap to work at its full potential, the spirals represent airflow detachment which is when the airflow separates from the wing resulting in a loss of downforce. The use of a Y100 Winglet / Monkey Seat as pictured above can remedy the airflow inconsistencies resulting in more low speed downforce. Of course these images are only to show you how it works and aren't directly representative of any of the teams solutions, as each approaches the solution differently depending on their current configuration and when they want peak downforce. 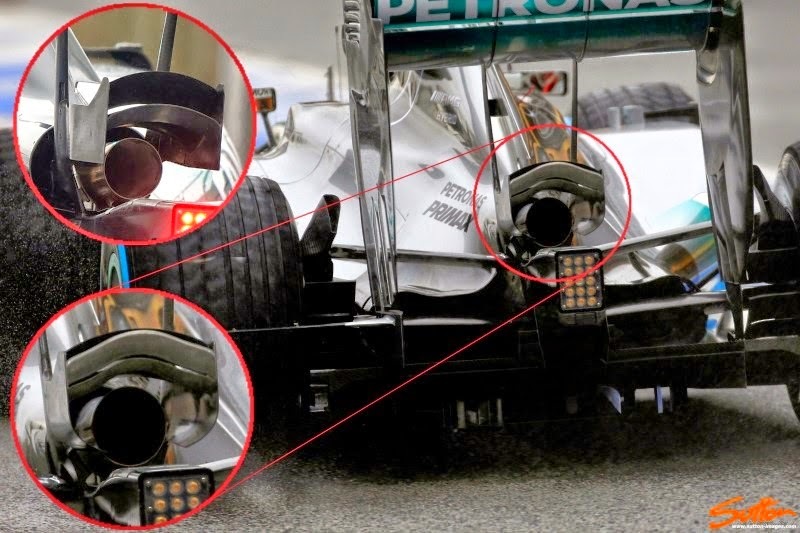 We are of course seeing teams using Monkey Seats all the time this season, that's because they are trying to utilise the exhaust plume that is within the vicinity, increasing the net effect and mitigating the loss of the beam wing. Mercedes arrived in Monaco with a new Y100 Winglet / Monkey Seat, designed to extract further performance, downforce and balance from the WO5. 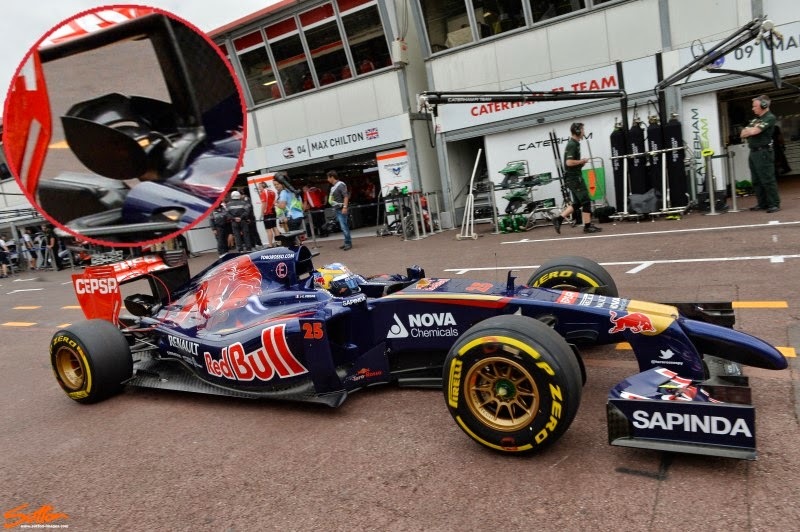 Their new Monkey Seat is a further development from the one tested by the team after the Spanish GP. Above: The team tested a new Monkey Seat at the post Spanish GP test, as we can see there are changes to the endplates (curved at their base) whilst the addition of two extra winglets above the exhaust to invoke the exhaust plume to upwash and are covered in high temperature paint. For Monaco the team have made further revisions with the Monkey Seat featuring much taller endplates and an additional horizontal winglet placed at the top of it which help to control how the airflow upwashes and interacts with the rear wing (without this the upwash may be too steep and interact with the rear wing too early). This season the teams are using the centreline exhaust in conjunction with the Monkey Seat in order to extract more downforce, it's a design principle that McLaren followed from the start of their campaign and many have assimilated. The idea is that the exhaust plumes low pressure high energy flow pulls the airflow through or past any bodywork that's placed within it's proximity. (In the case of McLaren their Venturi shaped pylon support which surrounds the exhaust) Mercedes have designed their new endplates with a curvature at the bottom of them in order to condition and isolate the flow to do similar, this is important as they've now extended their sidepod outlets to exit inline with the main central cooling outlet (amended for the Spanish GP). The additional winglets added above the exhaust that the team tested at Barcelona have been covered in high temperature paint (likely Zircotec) as these will invariably get hot due to their continuous interaction with the exhaust plume. All of these changes were made in order to create flow structures that allow the diffuser and rear wing to work in unison and create more low speed downforce. The chase for downforce is still on for the team that everyone else believes to have the most in hand, with the team adding a new upper winglet to complement the lower one the team have been using so far this season. Having decided to run a Y100 winglet under the exhaust and just below where the old beam wing used to run the team were/are clearly looking to enhance the way in which the diffuser interacts with the exhaust. The introduction of the higher Y100 winglet which sits astride their regular one looks to create further interaction with the underside of the rear wing, whilst undoubtedly utilising the exhaust plume as it exits below it. 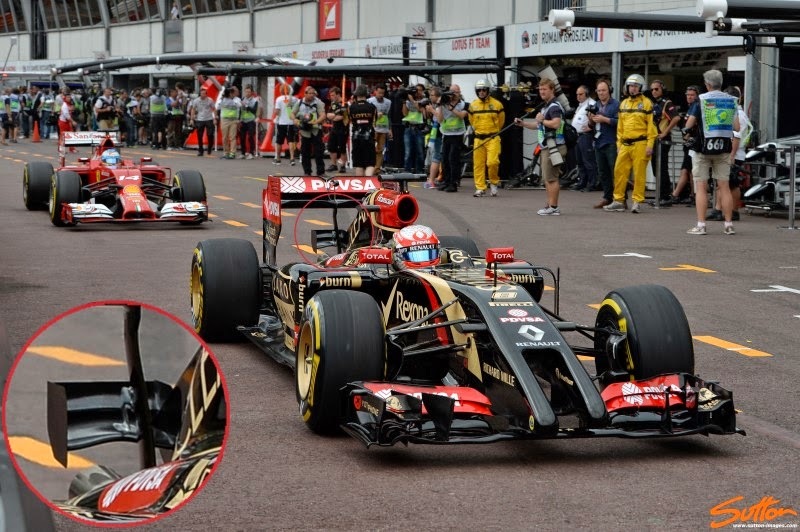 Having added a Monkey Seat at the Spanish GP the team revised its design for Monaco, introducing a secondary tier. 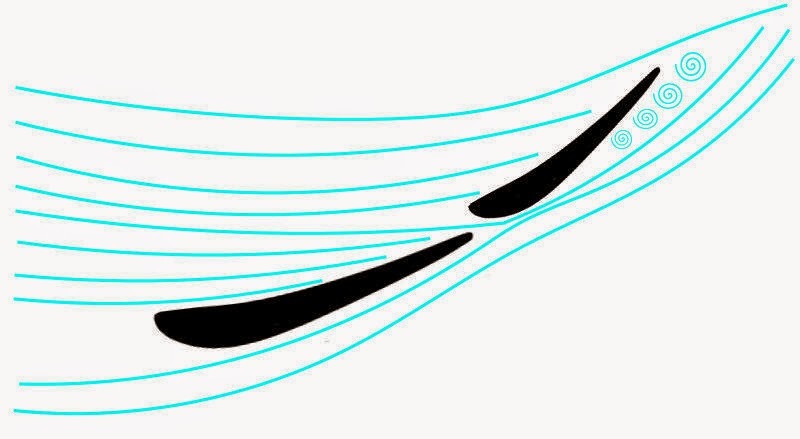 The two winglet approach is used to discern extra upwash, with the slot between the two winglets helping the upper one overcome the more extreme angle of attack of the upper winglet. 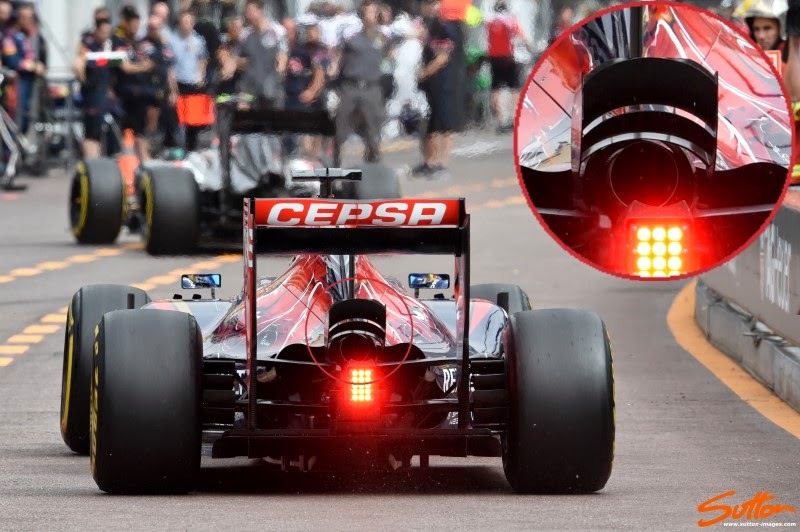 Toro Rosso converged on McLaren's singular mounting pylon (Y-Lon) as few races ago with the intention of using the cylindrical section that wraps around the exhaust to pull airflow through and over the Sidepods (amendments were made to these too, in order to exploit this). 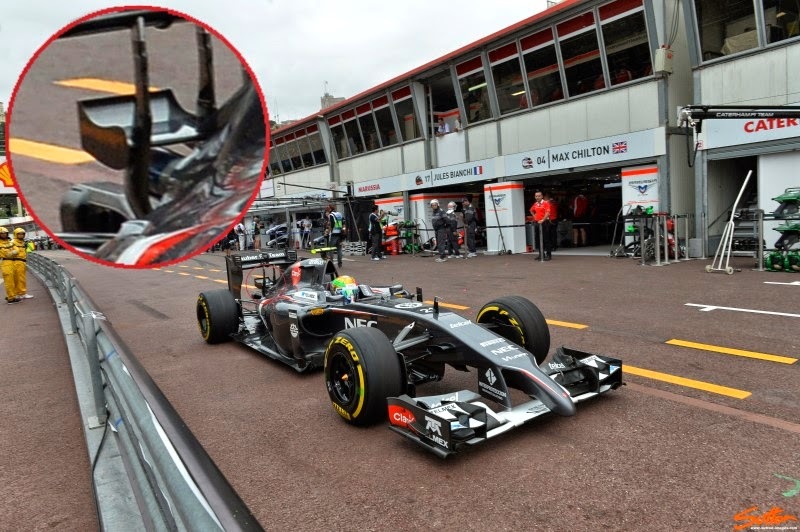 Continuing along the same path as McLaren the team arrived in Monaco with a new Monkey Seat which hung off the rear of the cylindrical exhaust cover. The double tier winglet looks to exploit the airflow in this region, creating up wash that would help both the Diffuser and Rear Wing work more effectively together. 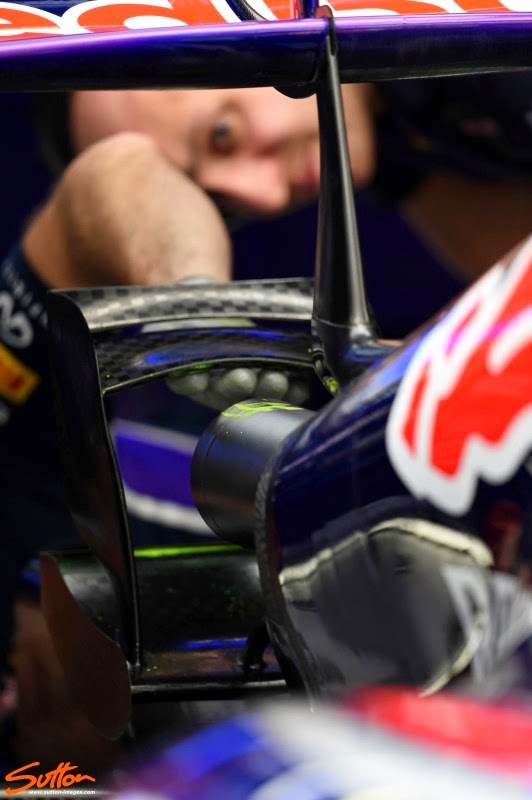 You'll note however that Toro Rosso's design features endplates on each of the winglets, these are usually used to increase the aspect ratio of the winglets and further condition the airflow. The Swiss team had a plethora of updates for the C33 in Spain, not all of which can be seen as successful with the team still struggling. Monaco provides a vast difference in terms of aero balance when compared to Barcelona and so the team ploughed on with the same parts, trying to further understand where they'd gone wrong. Like all of the teams mentioned above Sauber decided to run with a Monkey Seat for Monaco, which although they were chasing performance I'm quite sure it would have offered the drivers a little more balance too. It's awesome to read about the small tweaks that each team has been making. Thanks for discussing this and providing the details.